I am here to say, our house is on fire... I want you to act as you would in a crisis. I want you to act as if our house is on fire. Because it is. Unite behind the science, that is our demand. Today we use 100 million barrels of oil every single day...There are no rules to keep that oil in the ground... the rules have to be changed. We cannot solve a crisis without treating it as a crisis... if solutions within the system are so impossible to find, then... we should change the system itself. Our leadership has failed us. Young people must hold older generations accountable for the mess they have created. We need to get angry, and transform that anger into action. 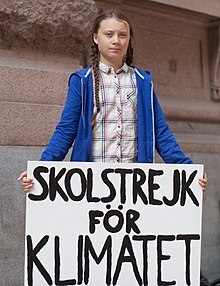 Greta Thunberg (born 3 January 2003) is a Swedish climate activist. In 2018, she initiated the School strike for climate movement and spoke at the United Nations Climate Change conference to denounced world leaders for their inaction: our leaders are behaving like children, we will have to take the responsibility they should have taken long ago. "I don't want your hope. I don't want you to be hopeful. I want you to panic...and act as if the house was on fire. Because it is." 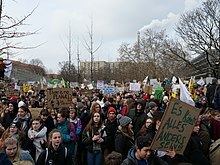 1.1 "You are stealing our future"
1.2 "School Strike for Climate"
There are no emergency meetings, no headlines, no breaking news. No one is acting as if we were in a crisis. Even most climate scientists or green politicians keep on flying around the world, eating meat and dairy. … Today we use 100 million barrels of oil every single day. There are no politics to change that. There are no rules to keep that oil in the ground. So we can't save the world by playing by the rules. Because the rules have to be changed. Everything needs to change. And it has to start today. "School strike for climate - save the world by changing the rules", TEDxStockholm (24 November 2018). We have to understand the emergency of the situation. Our leadership has failed us. Young people must hold older generations accountable for the mess they have created. We need to get angry, and transform that anger into action. "You are stealing our future"
We cannot solve a crisis without treating it as a crisis...if solutions within the system are so impossible to find, then... we should change the system itself. For 25 years, countless of people have stood in front of the United Nations Climate Change conference asking our nations’ leaders to stop the emissions. But clearly this has not worked, since the emissions just continue to rise. So I will not ask them anything. Instead, I will ask the people around the world to realize that our political leaders have failed us, because we are facing an existential threat and there is no time to continue down this road of madness. Our house is on fire. I am here to say, our house is on fire. [...] I want you to act as you would in a crisis. I want you to act as if our house is on fire. Because it is. Some people say that the climate crisis is something that we all have created, but that is not true, because if everyone is guilty then no one is to blame. And someone is to blame. Some people, some companies, some decision-makers in particular, have known exactly what priceless values they have been sacrificing to continue making unimaginable amounts of money. And I think many of you here today belong to that group of people. I think it is insane that people are gathered here to talk about the climate and they arrive here in private jets. In recent days, she has sharply rejected criticism of the strikes from educational authorities, telling the Hong Kong Education Bureau: “We fight for our future. It doesn’t help if we have to fight the adults too.” She also told a critical Australian state education minister his words “belong in a museum”. 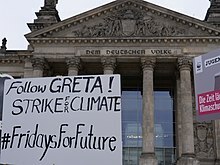 Keeping track of the fast growing number of strikes is difficult, but many are registering on FridaysForFuture.org. So far, there are almost 500 events listed to take place on 15 March across 51 countries, making it the biggest strike day so far. Students plan to skip school across Western Europe, from the US to Brazil and Chile, and from Australia to Iran, India and Japan. Over the past six months, she has become a superstar of the climate change movement. Her school strike, which started out with her sitting alone on a camping mat next to parliament, was swiftly highlighted by the media...She speaks softly, often simply nodding when addressed... she only speaks when necessary. "We must hold the older generations accountable for the mess they have created. ... and say to them you cannot continue risking our future like this." Teen climate activist Greta Thunberg calls on young people to use their anger as activism. As government ministers from around the globe gather in Katowice, Poland, for the final days of the 24th U.N. climate summit, we speak with 15-year-old activist Greta Thunberg, who denounced politicians here last week for their inaction on reducing greenhouse gas emissions. She has garnered global attention for carrying out a weekly school strike against climate change in her home country of Sweden. Thurnberg has an uncanny ability to concentrate... “I can do the same thing for hours,” she said....She began researching climate change and has stayed on the topic for six years. She has stopped eating meat and buying anything that is not absolutely necessary. In 2015, she stopped flying on airplanes, and a year later, her mother followed suit, giving up an international performing career. The family has installed solar batteries and has started growing their own vegetables on an allotment outside the city. To meet me in central Stockholm, Thunberg and her father rode their bikes for about half an hour; the family has an electric car that they use only when necessary.